The EDL Board of Directors declared n Monday that the company will be forcibly closed until contract workers and collectors end their sit-in. In a statement, the Board said that due to this step, power cuts are expected all across Lebanon in the next few hours. 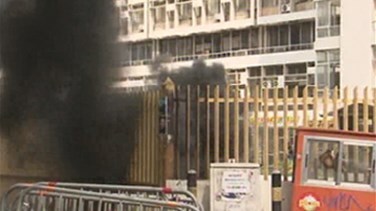 Later in the afternoon, the EDL administration announced that it will be moving to the Zouk power plant and called on President Michel Sleiman to task concerned authorities with ridding the company’s main building of protestors. Following this announcement, the Committee of EDL Contract Workers and Collectors responded by saying that the contract workers are not the cause behind the expected power outage; “it is a decision taken deliberately by the company’s directors”. The committee stressed that the contract workers in power plants are still doing their job. In a statement, the committee said that the company’s directors wanted to hold the workers responsible for the power cuts, “which is totally unfounded since the order to turn off or re-operate plants is issued by the Board of Directors." The committee added that this scenario reflects attempts to make people believe that the contract workers are responsible for this blackout. Earlier this morning, two counter-movements were held simultaneously at the Electricité du Liban (EDL). At the company’s seaside gate, the EDL contract workers burned tires at all the entrances they had closed with metal chains. Meanwhile, the company’s employees rallied near the eastern entrance to protest their inability to enter their offices. Following a meeting he held with EDL contract workers, the head of the General Workers Union Ghassan Ghosn reiterated his support to the contract workers’ “righteous demands”, calling for a unified rank for all employees. Ghosn said that there will be “no going back and no negotiations before all contract workers receive their salaries”. In protest of the employees and contract workers’ movements, merchants in the Mar Mikhael – an-Nahr region closed their shops. The EDL Board of Directors held an extraordinary meeting on Monday afternoon to find a way out of the current crisis.